I found a scorpion sucker at the grocery store. Just chilling there with the other impulse candy at the register. Scorpion. It’s even listed as an ingredient on the back. 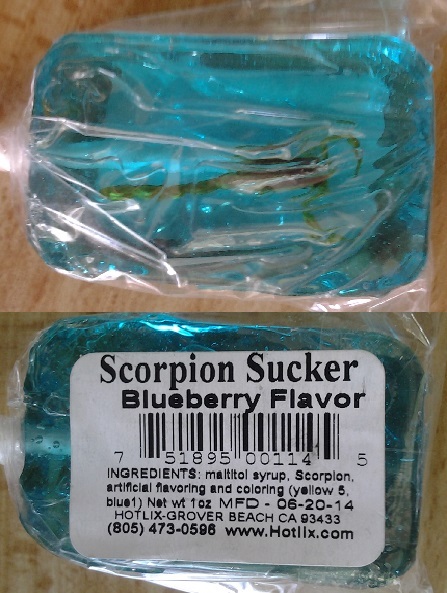 I guess you’re supposed to eat the scorpion when you’re done with the sucker? I don’t know. Sounds gross anyway. If you ever want to feel very, very fortunate that you don’t live in a squalid, mid-19th century city with squalid, mid-19th century medical care, this book will do it. I was hoping it would focus a little bit more on the individual patients whom Mütter treated, as he was known for taking the toughest, most interesting cases, but it was fascinating to find out how he directly revolutionized medicine in ways that we would consider common sense today. The Mütter Museum in Philadelphia now houses the huge collection of medical “marvels” he amassed in his lifetime, and is most definitely on the Travel Map. Kanab Creek Wilderness, Kaibab, Arizona – deep gorges. Lost Dutchman State Park, Apache Junction, Arizona – entry point to Superstition Wilderness. Tonto Natural Bridge State Park, Payson, Arizona – beautiful creek with a stone arch over it. Superstition Wilderness, Tonto, Arizona – hiking, legends, etc. Tanah Lot, Bali, Indonesia – island temple. Old Letchworth Village, Pomona, New York – abandoned mental hospital. Zabaikalsky National Park, Russia – on the shores of Lake Baikal. Pando, Fishlake National Forest, Utah – grove of aspen trees that is actually all one big organism, probably the oldest & most massive in the world. Sunflower, Arizona – 4WD trail to abandoned mine.